We had the pleasure of being invited to cover The Girlfriends & Champagne Brunch in Los Angeles, CA during the BET Awards weekend. Even more excited that the founder and one of the partners of Girlfriends and Champagne is a famous child star, Cherie Johnson. Cherie and her daughter Hailey made this brunch their 5th successful Girlfriends and Champagne event. Girlfriends & Champagne is famous for Spa Parties and Gifting Suites that take place during BET and Grammy Weekend in Los Angeles, California which includes a day full of massages, facials, manicures-pedicures and shopping at the Girlfriends and Champagne Spa Party and Gifting Suite. The sip and shop mixer is usually held at an upscale venue that also features an array of gifts, desserts, and food. Previous host and guest include Vanessa Simmons, MiMi Faust, Hazel-E, Torrei Hart, Mehgan James, Elise Neal just to name a few of the lovely ladies that have either hosted or attended the star-studded event each year. Pearls 4 The Girls – Tracy, Director/Creator with 20 years of experience. Her goal is to transform girls into ladies. She also did the decor for the event. Ross H. Flemming – Atlanta actor in the popular Netflix show “Boy Bye.” He is ENSPIRED by his daughter. “I have to be a King and pursue goals to me in a prominent place so she can have pride and be proud of her dad. He knew he had to be great for her. He needed to be that king to make his daughter the princess that she is. Bubba Ganter – Has been a Nickelodeon star, most recently Bunny on Game Shakers. Bubba is ENSPIRED to reach the youth. Working with a network catered to the youth he makes it his business to motivate others and support others endeavors. Amina Buddahfly – Known from Love and Hip Hop New York, Amina focuses on her two kids as inspiration. They motivate her to make music and bring out her creativity to share it with the world. Life has also “ENSPIRED” her to share her story with others. Profit The Problem & Penetration of Explicit Minds and Vivica Fox’s Black Magic in Las Vegas. Both encouraged to entertain in general. Lester Spate – veteran actor lets us know that his motivation comes from knowing he has a purpose. Not one to shy away from the God-given talents he has to reach others. He says he practices BizShow not ShowBiz. “You got to take care of your business before you show it!” He intends to leave a legacy of giving back and helping the community. Check out for charity events in Baltimore City: Lester Spate Golf Tournament and Comedy Show. 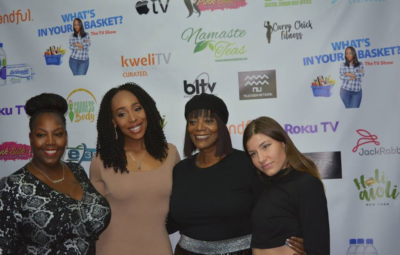 And talk show coming soon to Voice America.Cherie Johnson is a familiar face making moves on the west coast with her healthy, engaging events that bring together entrepreneurs, business people, actors and more together for a great time. Cherie Johnson first rose to fame at the age of six when she appeared on Punky Brewster as the fictional character Cherie and the show aired from 1984 – 1988. Pinky Brewster later extended into a cartoon series titled It’s Punky Brewster. which she contributed her voice for Little Cherie and it aired from 1985 – 1987 on NBC. One of her most recognized acting roles is in Family Matters where she co-starred as the character Maxine and the show aired from 1989 – 1997 on ABC and on CBS from 1997 – 1998 with 215 episodes. Cheri is not a hair product owner of Wild Cherry Hair Fresheners. Clearly, the grind has not stopped as we got to see first hand about her Girlfriends and Champagne Brunch. Realizing the bonds that were created amongst the women and guests who attended the spa parties and gifting suite, Girlfriends & Champagne Coordinator and Creator Helecia Choyce went into pre-production to create the late-night Talk Show “Girlfriends & Champagne.” The show was established to bring more awareness to current events and topics pertaining to the entertainment industry. Discussing ideas and sharing opinions and thoughts on certain topics. The panel host includes Helecia Choyce, Cherie Johnson, Sidney Starr and Anthony Cherry. The show is being aired on KDOC TV, On Demand and Cable Television as well as online.